Natural beauty takes center stage in Waynesboro, VA, and that shouldn’t stop with the mountains and parks. Your yard is an important part of continuing this beauty, and at Staunton Tree Service, we want to help you keep it that way. Use the form below to request a free estimate on your tree service needs in Waynesboro, VA.
Tree removal in Waynesboro, VA shouldn’t be taken lightly. With the vast amount of trees that are here, every removal needs to be done precisely so that no diseases or infestations are spread and nothing is harmed when the tree comes down. At Staunton Tree Service, we have the most knowledgeable staff that can accurately and safely bring your trees to the ground. Better yet, we do it without making a mess of your yard. Everything that we put into your yard will be cleaned up by our team. Call us today and we will be able to give you a quote for tree removal or to talk about options you have with keeping your tree on your property. Tree trimming and pruning is an activity that many homeowners think they are able to do by themselves, but what they don’t realize is that they aren’t doing a service to their trees. Tree trimming is important to keep your trees looking and feeling healthy, but one wrong cut can push them in the other direction. Professionals make calculated, meaningful cuts that add to the beauty and health of your tree. However, the deliberation and precision can only come after years of studying and experience. 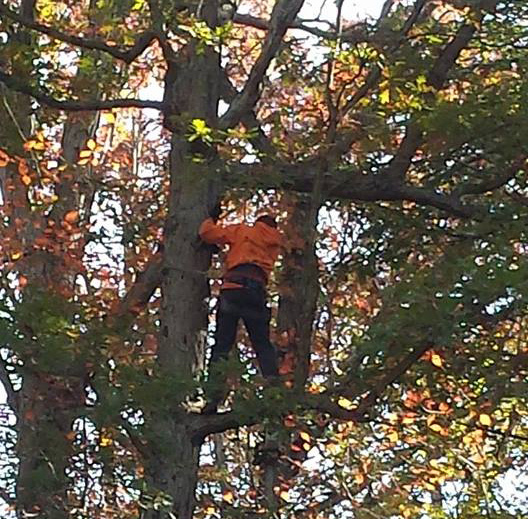 At Staunton Tree Service, we know all about those intricacies and more. Removing a tree often opens up some of the air space in your yard, but it can leave behind a stump that doesn’t give you much surface room. Other than being in the way and an eye sore, stumps can also harbor some pretty nasty diseases and pests that will eventually spread to your whole yard. Stump grinding is the only way to really treat all of the problems associated with a leftover stump. The procedure itself, when done by the right person and with the right tools, is fairly quick and easy. However, that requires a professional like those at Staunton. If your tree seems to be just a little weird, or it is showing signs of aging or disease, then you might want to call us immediately. Trees that are left untreated are likely to become bigger and bigger problems the more you weight. They fall victim to infestations, diseases, and are more likely to fall in a storm. At Staunton, we thoroughly investigate your trees from root to tip to try to find out if there is anything wrong, and then we remedy the problem. Tree risk assessment is really just a way to get peace of mind. Storms happen in Waynesboro, and that means that sometimes there is a lot of clean up. For particularly rough storms, there can be quite a bit. From trees that have been ripped from the ground to large branches on the ground, a lot of cleanup has to do with your trees. Staunton Tree Service can help correct your trees, cable them, and even haul away larger pieces using out wide variety of trucks and tools. Waynesboro is a beautiful location with a lot to offer. However, sometimes the trees to get in the way of seeing the beauty. At Staunton Tree Service, we are able to help bring out the natural beauty of your yard by helping with the maintenance and health of your trees. We are equipped with the insurances, tools, and equipment to handle the homes and businesses of Waynesboro.